I have always loved reading, so I feel blessed that Grace loves when we read to her, and also that she has plenty of books to pick from. We have our favorites that we like to read to her at night, like Curious George, the Berenstain Bears and of course, Dr. Suess. But Grace definitely has her favorites too. So, we usually read one or two of our favorites and then two of her favorites every night. Kyle and I are also enjoying reading the Harry Potter series to Grace, so we usually read a few pages of that to her too. Among Grace's favorite books is one called Hooray for My Family, written by Victoria Osteen. It was a set of three board books given to Grace shortly after she was born by Greg and Kim Matthews from our church family. They have always been among her top choices, especially the family one. When I lay beside her to read it at night, her eyes completely light up when you hold up Hooray for My Family. It has a photo of an illustration of a family at the dinner table, and we always point out the daddy, the mommy and the Grace, as well as the kitty, Joey. It's a "touch and feel" book, and when Grace was able, she knew exactly the places on each pages that were special. She also liked to help turn the pages, which always made me smile. The book has a page for each family member, and each one rhymes. I love the one I've got! so I won't smell like Spot! Funnily enough, Grace's favorite page is about being thankful for her aunt and uncle. The aunt in the illustration has red, curly hair, and she starts talking as soon as we turn to that page, even though two of Grace's aunts have very blonde hair. But most importantly, the book is a constant reminder of the importance of family. 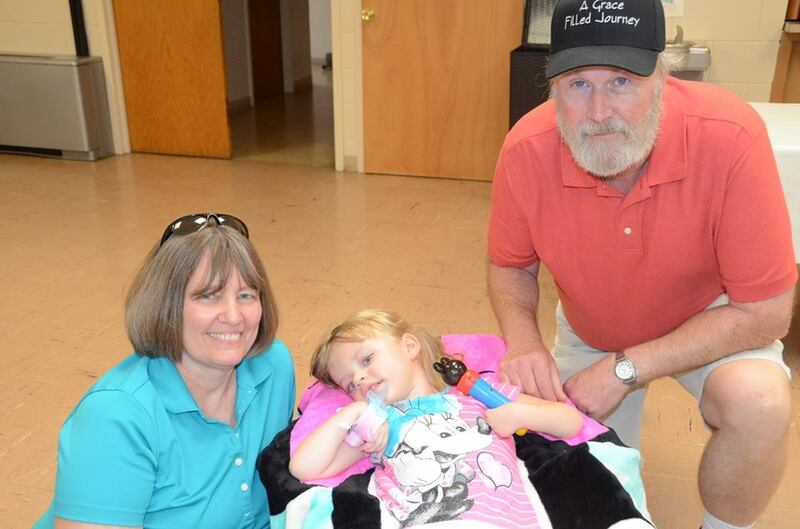 We are so lucky to have both sets of our parents close to us, and they are a great help with Grace. Grace loves the chance to play with her cousins and her aunts and uncles, and just loves being around the people that love her the most. I think that's probably why she loves that book so much. It seems like it was written about the people that she cares the most about. We have read it to her so many times that both Kyle and I know it by heart. But we never stop reading it to Grace each and every night, because her eyes light up when we read it, just like they light up when she spends time with her family. The other book we read every night is called, All the Ways I Love You, and was a Christmas present from her Grandma and Grandpa Galer one year. It's another rhyming book, and a short one. But it's also one that we know by heart. I love you quicker than a minute. I love you longer than an hour. Loves buzzing round a flower. The book talks about all the ways a momma bear loves her baby cub, and it makes my heart so happy to read it to Grace. The final page talks about the unconditional love that parents have for their children. I love you round and round the world. to love you more . . . I do. Sometimes, if Kyle and I are reading it together to her, we change all the I's to We's. I don't actually know if Grace understands the words as we are reading them to her, and I know she may never be able to say the words, "I love you." But I do know without a doubt, that Grace knows the unconditional love we have for her. We see it when her eyes light up when we are playing, or in the smile she gives us when she is happy. And we know that she loves us too, even if she can't use those words. I don't know the exact number of times we have read these books to Grace, yet I never tire reading either of them to her. I will share with her the importance of family and unconditional love as many chances as I get, especially since I already know the stories by heart. 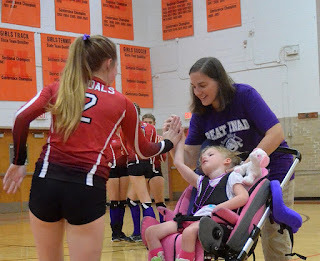 We had so much fun at this season's first Volley for Grace night Thursday night, Sept. 15, when the Hillsboro Lady Hiltoppers hosted the Vandalia Vandals. Technically, this was supposed to be the second of three Volley for Grace nights, but Lincolnwood High School was without power one night last week, so their game against Morrisonville has been rescheduled. The bake sale and some of the goodies Grace got to take home! All four high school teams participating in this year's Volley for Grace games (Hillsboro, Vandalia, Lincolnwood and Morrisonville), joined together in creating new purple and white shirts, and the teams gathered a total of 61 sponsors to help fund INAD research. Grace and her friend, Dahlia, before the game! Wearing our new shirts, we arrived at the high school during the junior varsity game. The most striking thing walking into the gym was that instead of seeing orange and black for Hillsboro and red and white for Vandalia, the gym was a sea of purple for Grace. It was really awesome. Grace helped me pick out some treats at the bake sale. In the lobby, parents had set up a bake sale by donation to raise money for INAD and we had the chance to see some of our Grace-Filled Journey scarves. Before the start of the varsity game, we picked out some bake sale items, and they were delicious. Presenting checks for INAD research before the game. Just before the start of the varsity game, the announcer called us to the gym floor. Grace and I went out, and Kyle arrived a little late at the game because he was covering a meeting. The two coaches and a player presented us with checks from their sponsorships, totalling $1,500. Each team had also taken a team photo with Grace, and presented us with a framed and signed copy for our house. It was pretty special. Getting to share our story and say thanks to the crowd. As we headed off the floor, one of the Toppers biggest fans, known for leading the infamous "TOPP-ERS" cheer, started a new cheer across the gym. He yelled out "Amazing," and the student section yelled back "Grace." I have to admit it brought a few tears to my eyes on such a special night. The players wore purple ribbons and socks during the game! The Hiltopper student section was decked out in purple too! One of the Hillsboro players had asked if Grace could give high-fives to the starting line-up, and we were thrilled. Many of the players had worn special purple socks and purple ribbons in their hair. Grace and I stood mid-court, and wished good luck to all the players on both teams, giving a high-five before the start of the game. 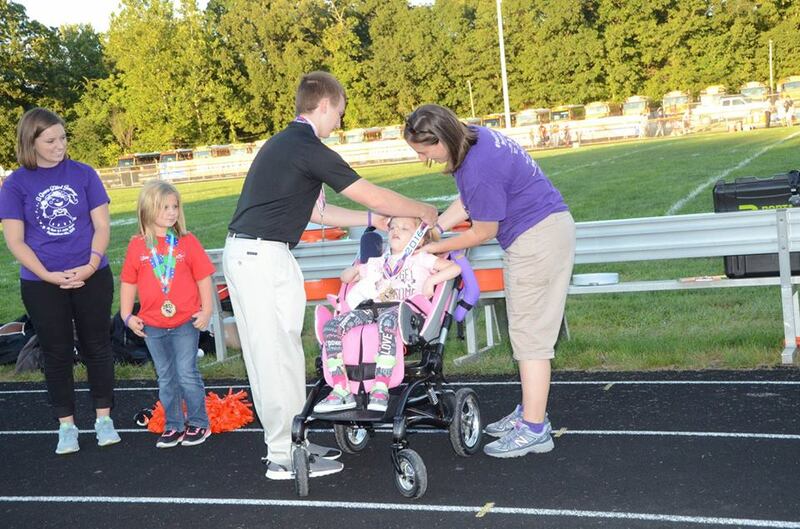 Our friend, Rich Bauer at the Vandalia Leader Union, captured this special moment before the game. 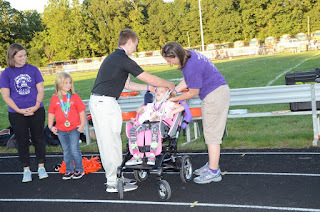 Just before the start of the varsity game, one of the Hillsboro student fans gave Grace some purple beads to wear during the game. When I looked up, she had purple writing down her legs. One said "Grace," and the other said "Beat INAD." It's really neat to see the students so excited about helping out our cause. Grace and the awesome volleyball coaches! All too soon, the game was over. Hillsboro would win in two games, but the outcome of the game wasn't nearly as important as the hearts of the players, who have so graciously joined A Grace-Filled Journey. With the bake sale raising just over $400, the night raised a total of almost $2,000 to benefit INAD research. We feel so blessed to help support research that we know will make a difference in the lives of INAD families for years to come. Hanging out with Betsy before the game! Family photo op after the Volley for Grace game! If you missed out on the first game, you have two more chances to be inspired by the generous hearts of our local high school teams. 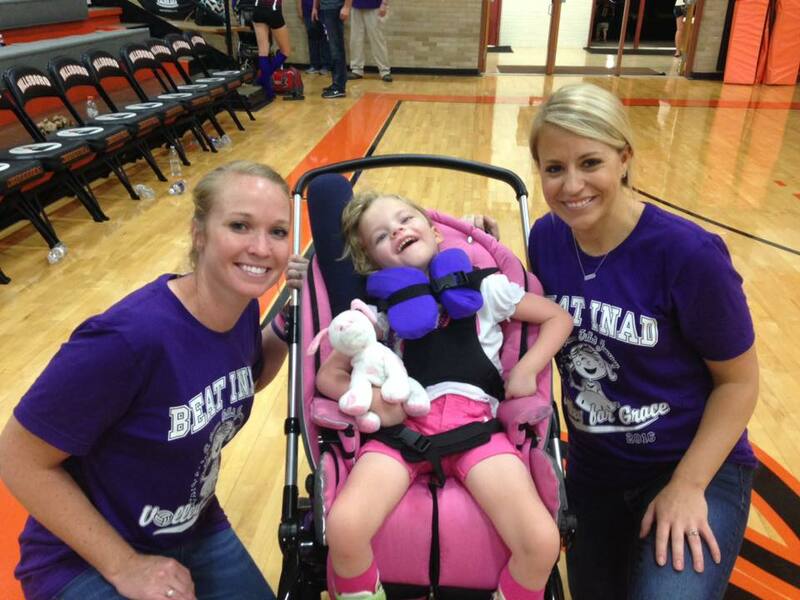 On Monday evening, Oct. 3, Lincolnwood will host Hillsboro in Raymond for another special Volley for Grace night. They will also host Morrisonville on Tuesday, Oct. 18, for the final fundraising event of the season. If you have a chance, stop by one of the games and wear your favorite purple clothing. I promise you will be inspired by players and coahces who know there is so much more to life than winning and losing. It will be a night you will never forget. I know we won't. It seems hard to believe that five years ago, we were at St. Francis Hospital in Litchfield meeting the biggest blessing of our lives. And though it's definitely been a roller coaster, we are so blessed to have another year to celebrate on this "Grace-Filled Journey." We typically host Grace's family birthday party on the Sunday afternoon before Labor Day because it's not a paper day for us. And it seems to work well. 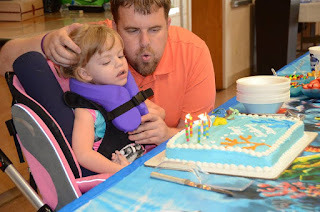 Daddy helped Grace blow out the candles on her Dory cake. Kyle, Grace and I had a ball at the party store several weeks ago trying to decide what kind of party to have. We ended up with a Finding Dory theme, since we had so much fun at the movie together this summer. The three of us picked out some Dory plates, napkins and decorations. Then, it was time to set up for the party. Grandma Susie made the Dory cake and Grandma Kim brought all the fixings for ice cream sundaes. And I was lucky to have such great help setting up for the party! Going for a ride in her new birthday wagon! Kyle brought Grace close to the time to start the party, and she enjoyed getting to see both her cousins, Keelen and Quincy. After setting up a few photos, it was time to sing "Happy Birthday," and Kyle helped Grace blow out her candles. He even helped her enjoy some cake and ice cream during the party. Hanging out with her cousins, Keelen and Quincy. Posing with Grandma Kim and PaPa Randy. Posing with Grandma Susie and PaPa John. And then it was time for presents, and we are truly blessed. Grace got so many nice new clothes, a new wagon and even a special display case for some of her autographed baseballs and bats. It was a pretty special day. 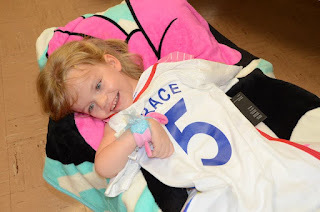 Grace got a personalized US soccer jersey for her birthday. 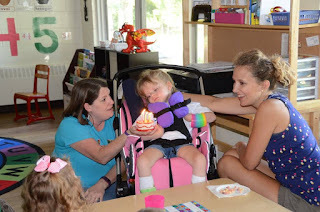 When the day of her actual birthday rolled around, it was Wednesday of that week, which coincided with the first day of preschool. So, she got to celebrate there too. We filled out her birthday train and made treat bags for all her new friends at school, with some of Grace's favorite things like bubbles and M&Ms. Grace had fun showing her preschool friends her birthday train. 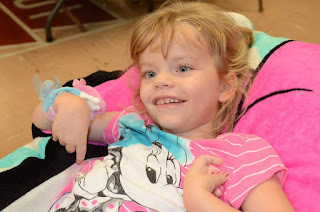 She really enjoyed her friends singing to her at preschool and getting a new multi-colored slinky from the birthday box. We even brought one of her favorite preschool snacks, Berry, Berry Kix cereal to share with her friends. 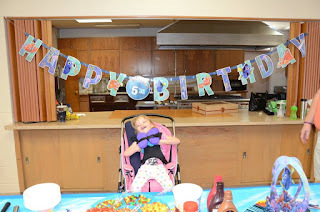 It was another fun way to celebrate turning five. 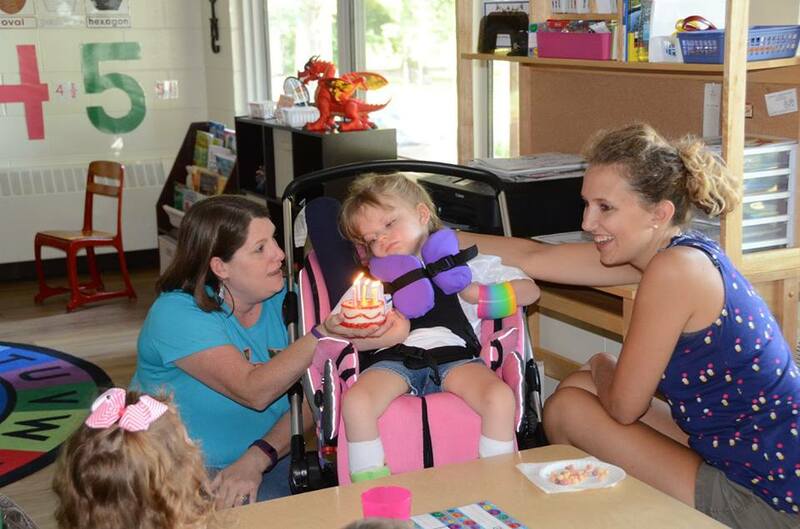 Blowing out candles at her preschool party. As I look back through old photos, it seems hard to believe that five years have gone by. 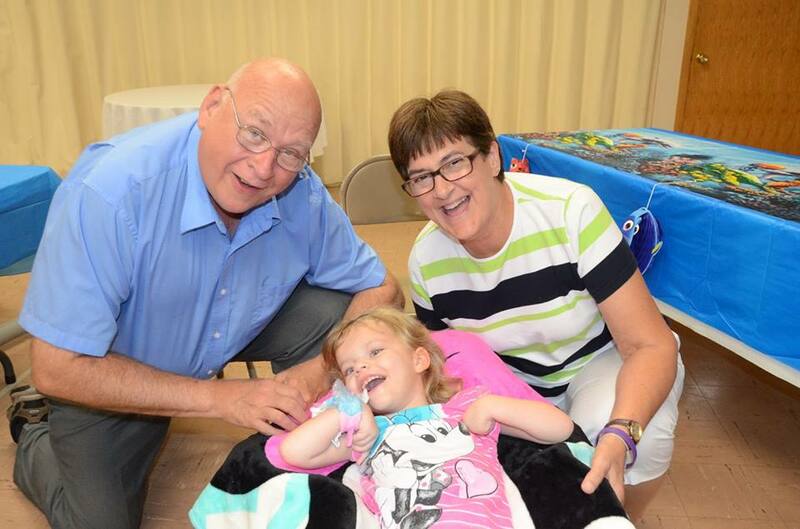 Grace's journey is much different than other kids, and sometimes that can be hard on mom and dad. But she always has a smile and the sweetest laugh that reminds us that different is okay. 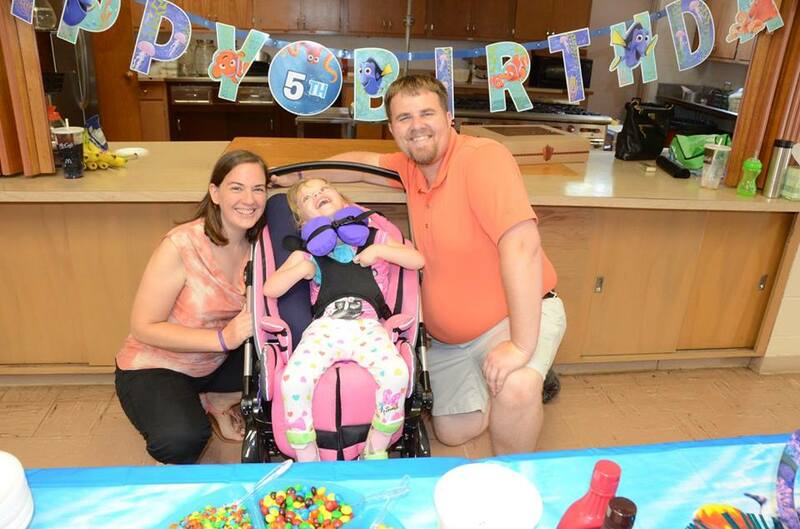 Grace will always be our "ladybug," and whether we get to share another five birthdays with her or 50, we will cherish each and every memory. Happy 5th Birthday, Sweet Grace! It's been weeks since the bright lights of the Olympics have dimmed in Rio. But the true spirit of the Olympic Games came to life once again last Friday night when Grace was awarded her very first gold medal. 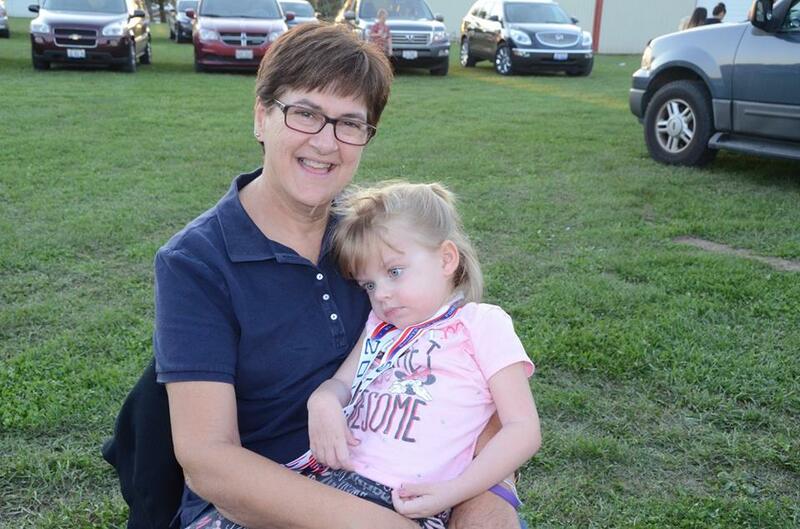 It all started several months ago, when our friend and Morrisonville teacher, Janet Walch, sent us a message that her nephew, a world champion power lifter, wanted to meet Grace. Grace is all ready at her table for the football game. Meet 17-year-old Karter Brachear of Taylorville. In the world of power lifting, he is an eight-time world champion, 23-time world champion and has won 15 gold medals at the AAU Junior Olympics. Karter has also broken more than 200 Illinois state records, 56 national records and 48 world records, in addition to being named an AAU Academic All-American for his performance in this classroom. But what sets Karter apart as an athlete isn't the records he's broken or even his schoolwork in the classroom. Four years ago, Karter and his family founded the Gold Medal Team, which awards gold medals to individuals who inspire him with their stories. All lined up and ready for the medal presentation. 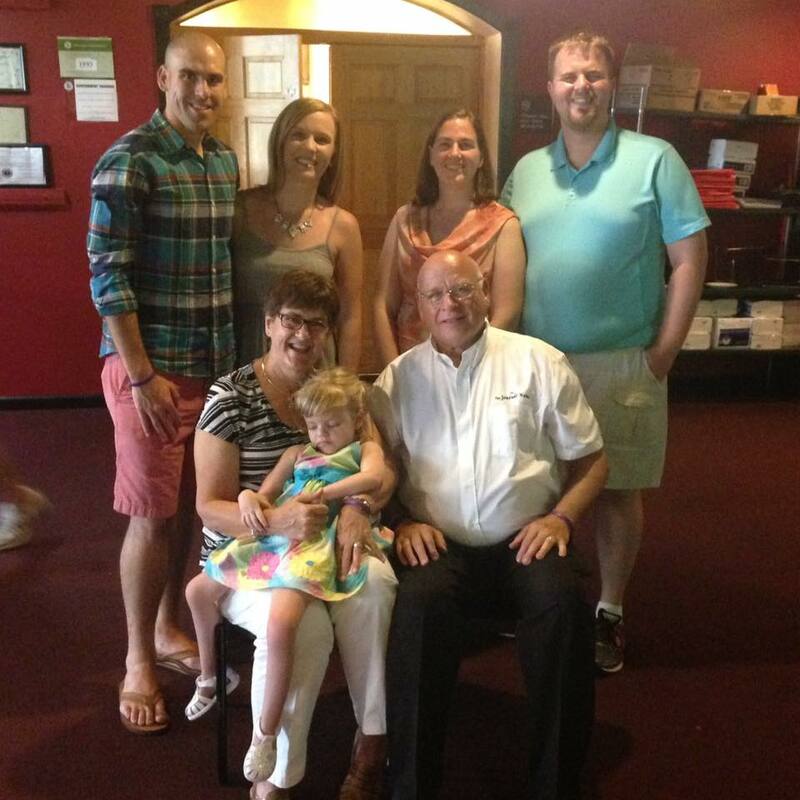 We were lucky enough to meet the first inductee onto the Gold Medal Team and her family at Grace's ceremony. 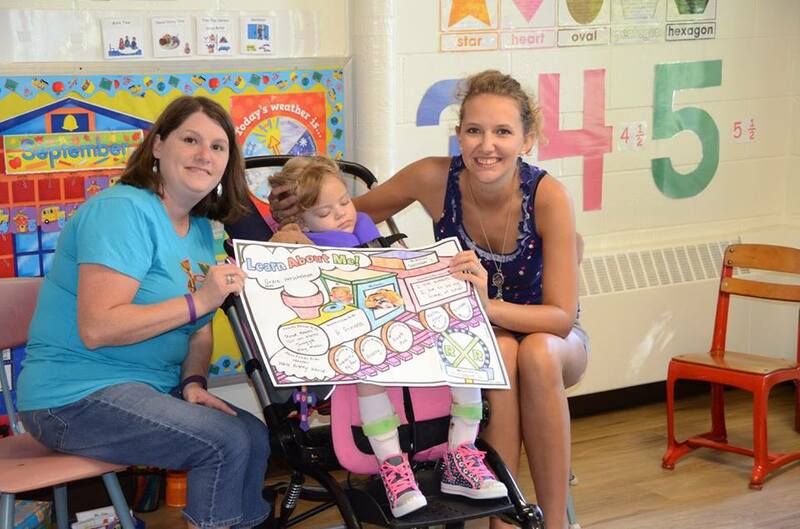 Karter met Lauren Reuther, who now lives in Auburn, when she was a patient at St. John's Hospital in Springfield, battling what is known as "brittle bone disease." She continues to be a champion for that cause, and was kind enough to come down with her family to be part of Grace's night too. Karter presenting Grace with her medal. 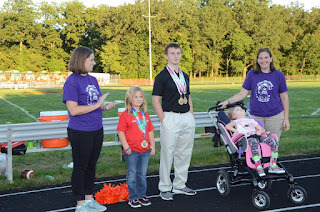 Since the founding of the Gold Medal Team, Karter has now presented four of his 15 gold medals to special recipients, and we were so honored that he picked Grace this year. 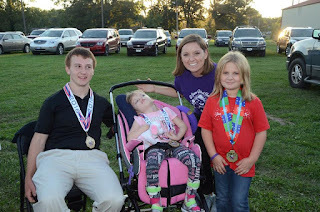 Earlier this summer, Karter and his dad made the trip to Hillsboro to meet Grace, and they started talking about ideas about how to present the gold medal. 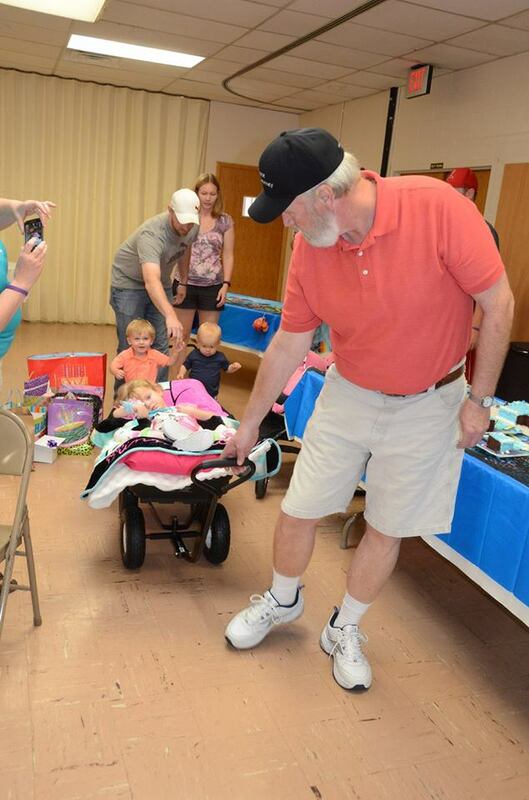 Karter's dad, Doug, wanted the ceremony to help bring more awareness and funding for INAD. It was such a "golden" moment for Grace. We ended up deciding to make the presentation at a Hillsboro High School football game, and Coach Aaron Duff and his team were gracious enough to allow us some time before their home opener. Kyle also set up a GoFundMe account called Gold for Grace, which raised over $300 for INAD research at Washington University. The Gold Medal team with State Representative Avery Bourne. The night of the ceremony finally arrived, and we were blessed that State Representative Avery Bourne joined us for the presentation to help raise even more awareness about INAD. We all gathered before the game started, and even though Kyle couldn't come because he had to cover another football game, we sent him a lot of photos. Hanging out with Grandma Susie at the game. We made our way to the track, and Journal-News publisher Mike Plunkett was the announcer for the football game. 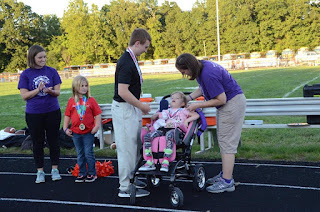 He did a great job making sure things went smoothly, and I got to help Karter officially present one of his gold medals to Grace. It was such a special moment to be a part of, and we are so honored that Karter chose Grace to be on his Gold Medal Team. Her buddy, Lindsey Storm came over to say hi! 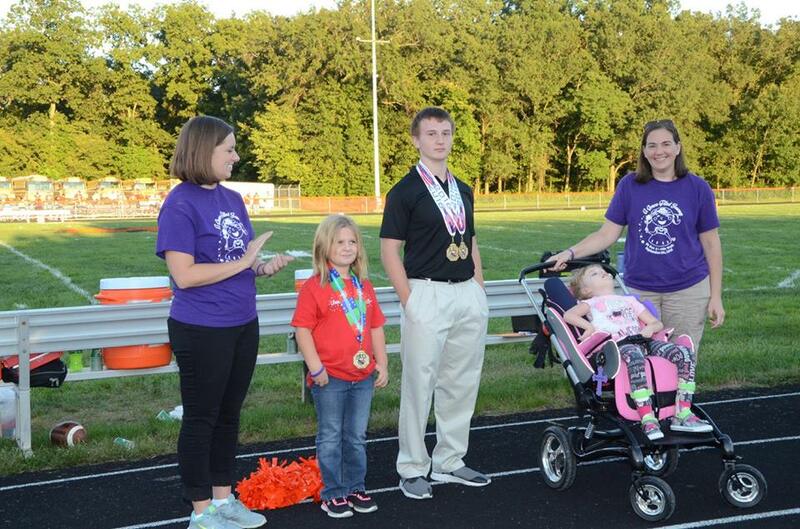 After the presentation, Karter, Lauren and Grace posed for photos with some of their adoring fans, and we enjoyed sitting around and visiting with their families for the first half of the football game. Grace got a little fussy toward the end when she was tired and ready to go home, but all in all, it was a great night. 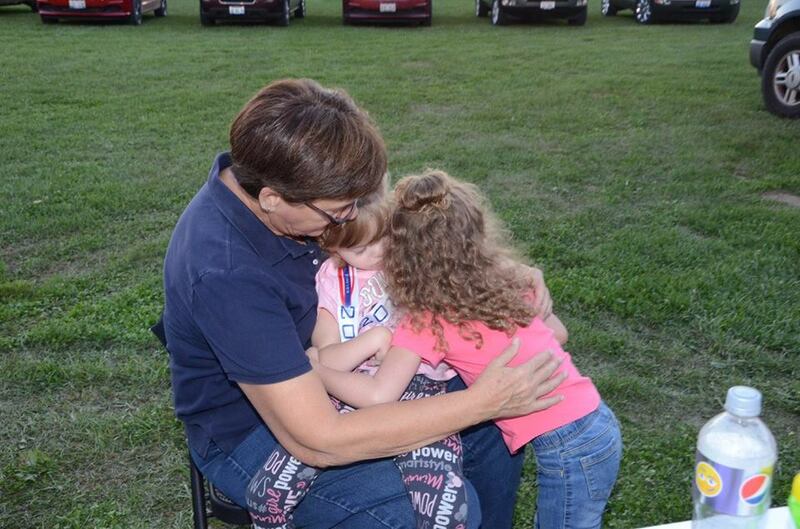 A special hug from her friend, Dahlia. One of my favorite parts happened the next morning. When Grace woke up, she and I got out her gold medal to show Kyle. As soon as she saw him, her eyes lit up and she began vocalizing to him. Although she can't actually use any words, I know she was trying to tell him all about getting her very own gold medal and how excited she was. And I knew Kyle understood exactly what she was trying to tell him. 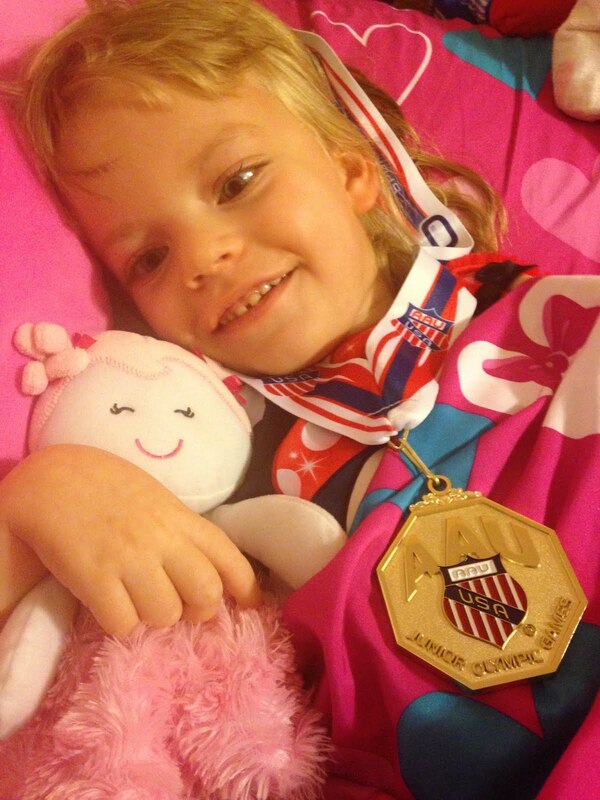 Although I didn't let her sleep in her medal, she was definitely all smiles after a great night! As I close the blog, I'm going to include a special letter that Karter wrote to Grace about his journey and why he started the Gold Medal Team. We are truly humbled for such a golden moment on this "Grace-Filled Journey." I have had many opportunities over the past few years to meet incredible individuals who just by their presence make the world a better place. Individuals who live their lives to help others including people they meet and others they never will. The common trait I have found in these special people is they remain positive regardless of the circumstances they face, accept what they can't change and work relentlessly to positively change what they can. They share the struggles and the victories. They are unique in that they willingly and happily share their special gifts without asking for anything in return. They are the people I consider to be my role models and strive to emulate. I learn from them and am inspired to train, compete and win. Four years ago I met Lauren Reuther. She is a champion, and exhibits all of the traits listed above. I awarded her one of my AAU Jr Olympic Gold Medals and together we started the Gold Medal Team. Each year I compete at the Jr Olympics and look for an inspiring individual to join our team. Early this year I learned about Grace. My aunt Janet told me about her and her amazing parents. She told me about "A Grace Filled Journey " and I started following her story. I had to meet her and her parents. Grace is so properly named. She lights up a room with her smile. Her story is inspirational. Daily she faces adversity and moves through life with grace. 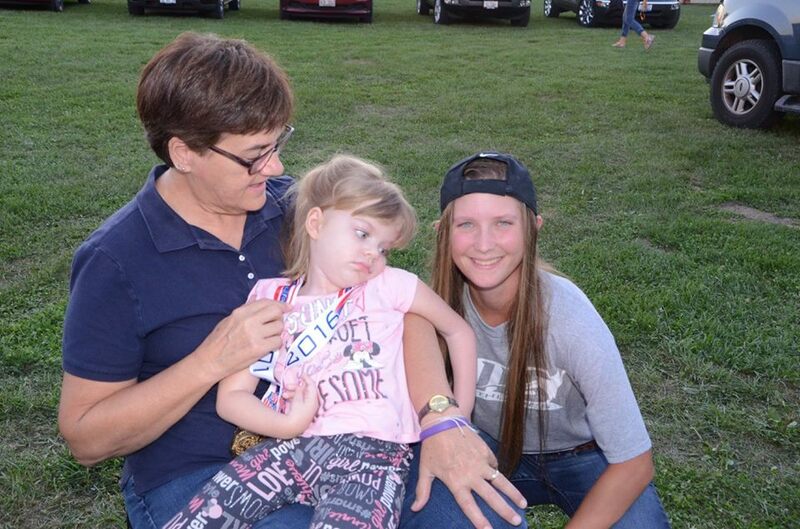 She has a very rare genetic disorder which is currently not treatable or curable. 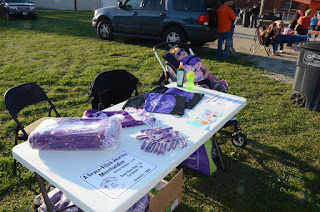 Many would not, but she and her parents work continuously to raise awareness and funds to fight INAD. Her story is shared through " A Grace Filled Journey ". If you have not yet become a follower look it up. It is a very positive and inspiring blog. Grace lives, and reminds us not to exist but to truly live. Tonight, Lauren and I welcome Grace onto The Gold Medal Team. She earned this medal. Grace and her parents are role models, and I am very thankful that we met. Grace, Mary , and Kyle will not ask for anything and did not ask to join this team. It was my idea and I asked them. I need to thank a few people for making this night possible. My parents for their support, my grandmother "Linda Mommo" for making my dreams possible, my coach, Steffen Smith, for pushing me to reach my potential, coach Duff and the Hillsboro Toppers for providing this location, and Avery Bourne for joining us to help raise awareness. Tonight, I am going to ask everyone here to follow Grace's lead and give what you can to fight INAD. We all have something to share and together we can make a difference. The Gold Medal Team will be available for pictures with you through the first quarter for the donation of your choice. Donations can also be made through Go Fund Me account "Gold for Grace". If a donation is not possible please share what you have seen tonight, enjoy the game, and treat each day as a gift. As we turn the calendar over to September, it seems hard to believe that another summer has come and gone! And this one has definitely been a busy one for us. 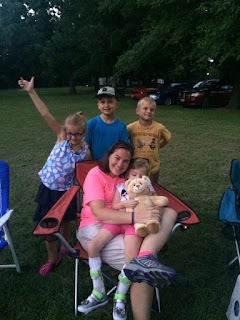 We went to Branson with Kyle's family, celebrated both of our nephew's first birthdays and even managed to squeeze in a few Grace fundraisers. 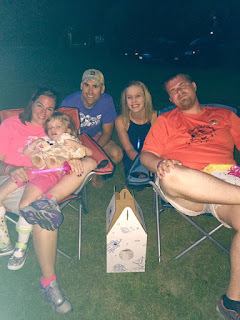 The last month of summer seemed to fly by with Old Settlers and a visit from Uncle Johnny and Aunt Emily, and we just wanted to share some photos and some of the fun we had. It started with the annual Old Settlers celebration, held the first week of August in downtown Hillsboro. 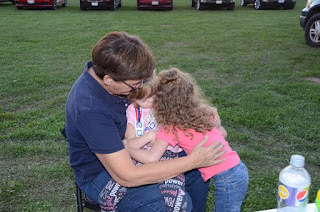 Usually, Grace makes her way uptown on Sunday for the pigtail and ponytail contest, but since we got her hair cut this spring, she didn't make it up there this year. Old Settlers wouldn't be complete without a pronto pup and a lemon shake-up! 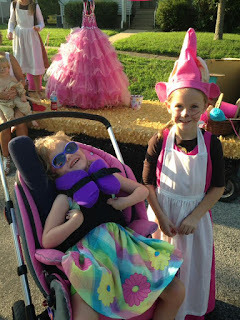 So her Old Settlers officially started on Thursday with the Kiddie Parade. 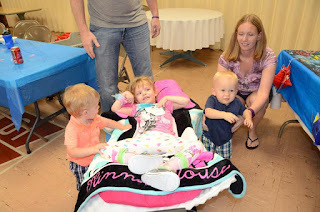 This year's theme was "What Makes Me Smile," and Kyle and I decorated her Stingray stroller like a swimming pool. Grace has been in the Kiddie Parade every year since she's been around, and it's always one of our favorite things. We don't really strive to win, Kyle and I just enjoy putting on our creative hats and finding something that works for Grace. Gracie Lou loved her swimming float! This year, we had a ball putting together Grace's Mini Float, and then had a good time visiting with everyone getting set up for the parade. Grace even got fifth place in her division! Hanging out with cousin Izzy before the parade started. 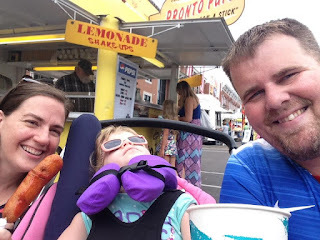 Usually, we take Grace up and down Main Street for a little bit to see the art show and take a ride down the big slide, but this year, we all got kind of hot at the Kiddie Parade. So, after the ceremonial dumping of the Kiddie Parade float, Kyle and Grace went home to cool off. And I stayed uptown to get some work done and have lunch with Johnny and Emily. Family photo opportunity at the reception for PaPa John. That afternoon was a special one for our family, as my dad got the Hillsboro Educational Foundation Distinguished Alumni award this year. That was one of the reasons John and Emily came home for the week, and we were glad to see them. We were also proud of Grandpa John for all his hard work for his community over the years. Grace wearing her princess crown at the parade. Grace with Little Miss Jenna, who gave her the princess crown. 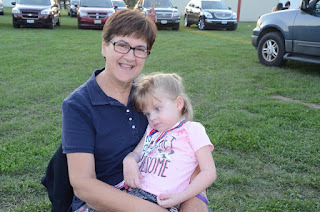 Grace also enjoyed hanging out with me, Emily and Grandma Susie to watch the Big Parade that night. 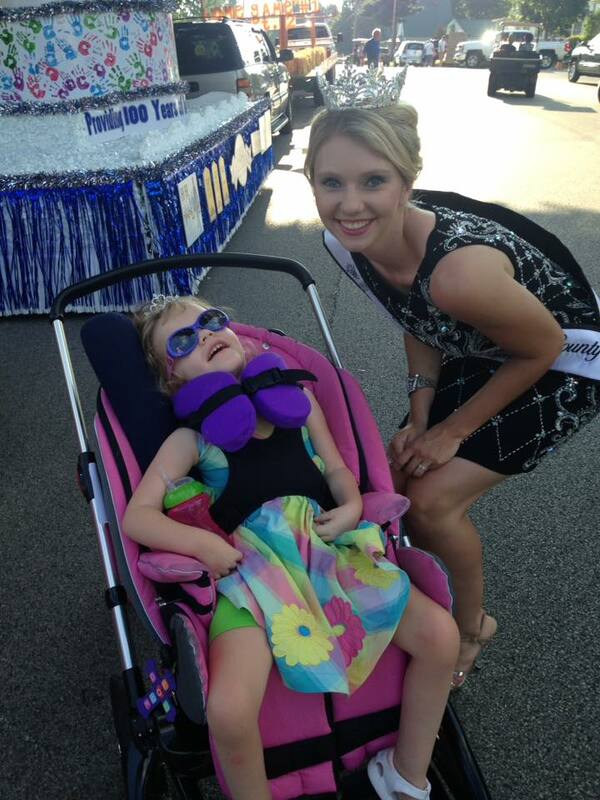 She wore a special crown she got from retiring Little Miss Old Settlers Jenna Durbin, and stopped by to greet Miss Montgomery County Fair Queen. 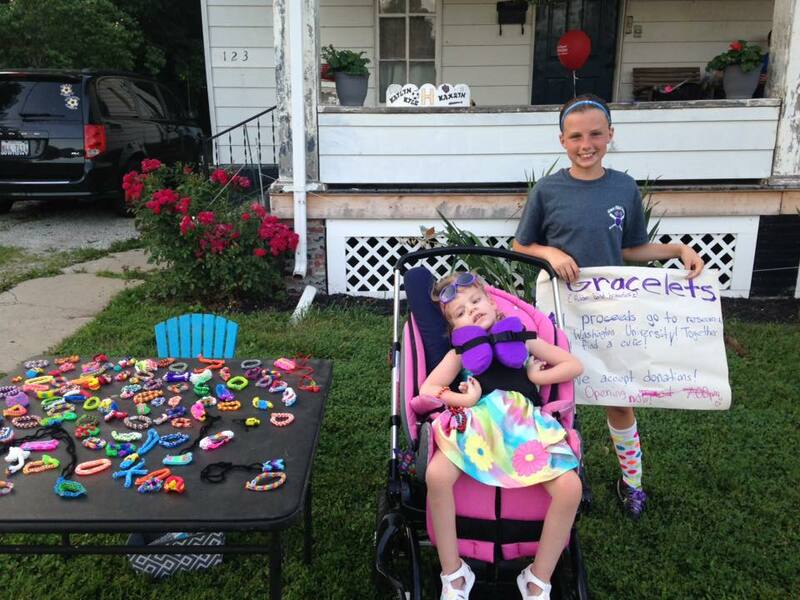 Our friend Kamryn Kiper also set up a table to sell "gracelets" she made and raise money for INAD research. Hanging out with Queen Ailie. Kamryn made all these awesome "gracelets" and sold them to raise money for INAD research. Since Johnny and Emily were home for the weekend, we made the most of our time together, taking in a St. Louis Cardinals game and enjoying a family cookout. The Cardinals had a special promotion going on, and all fans got a free red Fedora hat during the game. 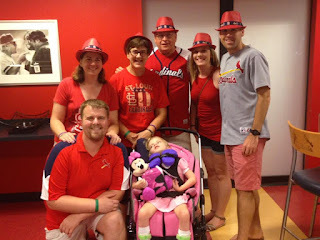 Uncle John and Aunt Emily had gone early and bought Grace a St. Louis Cardinals stuffed Minnie Mouse, which brought a big smile from Grace. All smiles with her new Minnie Mouse! Snuggling with Grandma and Grandpa. 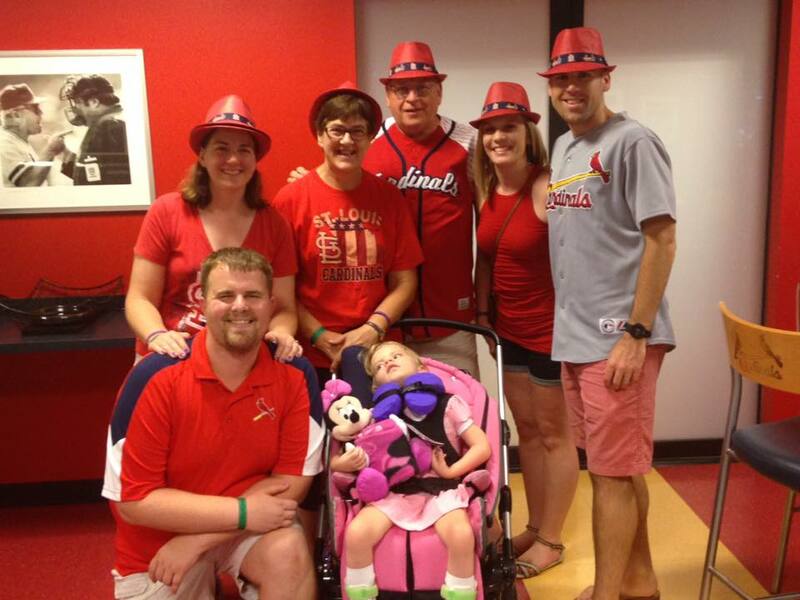 Family photo opportunity at the Cards game! 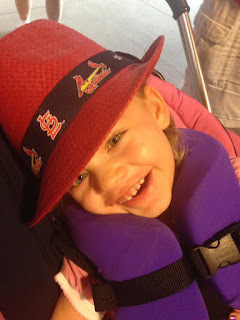 My favorite photo of Grace at the Cards game! We also had some special guests at the family cookout, as my cousin Todd, and his family were down from Naperville. It was fun to catch up with the kids since we don't get to see them that often, and they brought Grace a new Build-A-Bear named Lollipop. We also enjoyed good food and a fireworks display by dad and Johnny. Hanging out with Johnny and Emily at the cookout. Grace's cousins from Naperville got her a new Build-A-Bear named Lollipop. It was so much fun to have John and Emily home for a few days, and we hated to see them go back to Alexandria. But we will get to see them again in December. The rest of the month of August seemed to fly by. We spent a lot of time watching the Olympics together as a family. 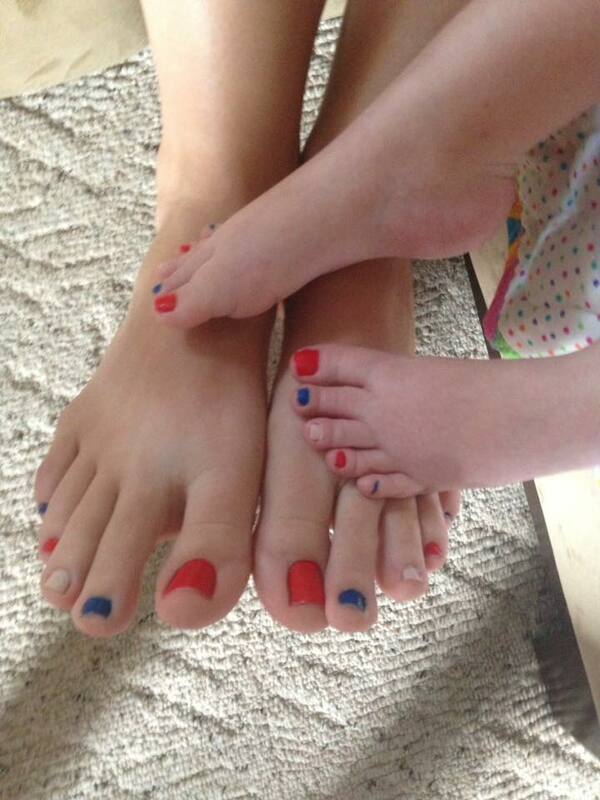 Grace and I even got matching patriotic manicures and pedicures to celebrate. Matching red, white and blue pedicures for the Olympics! 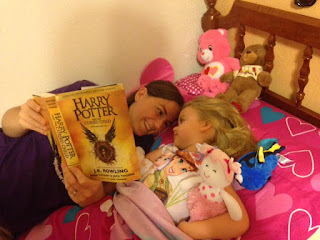 Oh, and we also got to finish reading the newest of the Harry Potter books, thanks to our good friend, Mrs. Reeves!! I read it out loud to Kyle and Grace, and they really liked it! We can't wait to keep reading the rest of the series! Reading the newest Harry Potter book! The end of August means the start of school, high school sports and fall weather. Since it was so hot this summer, we didn't get the chance to take as many walks as we would have liked or swing in my new swing. But we are definitely looking forward to some cooler fall weather. Although the summer had to come to an end, we will cherish all the memories we made with family and friends, and look forward to the start of a new school year for Grace.